CBN wheels and Diamond Wheels are the leading superabrasives available today. Eagle Superabrasives expertly manufactures and stocks over 6,000 diamond and CBN wheels in our Hickory, NC location. That makes us one of the leading suppliers of superabrasives in the country. A powder made from the Borazon crystal coats each CBN wheel. One of the hardest known materials on earth, Borazon forms when equal amounts of Boron and Nitrogen are heated together at temperatures exceeding 1800 degrees Celsius. Although diamond wheels were once the preferred superabrasive for industrial grinding, the diamond’s carbon content would dissolve iron at high temperatures. This made diamond wheels ineffective at grinding steel tools. Today, CBN wheels grind hard ferrous metals, nickel- and cobalt-based superalloys, and cast iron. And because the Borazon crystal can withstand temperatures greater than that of a diamond, CBN wheels are great for grinding hardened steel tools, cutting glass and diamonds, and jewelry making. 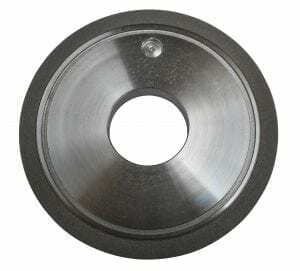 CBN wheels grind more material, at a higher degree of accuracy, than any other superabrasive available today. The only limiting factor of a CBN wheel is their bonding system. More often than not, the bond will fail far sooner than the breakdown of the cutting surface. To prevent this from happening, Eagle Superabrasives ensures that all of their CBN wheels feature their superior bonding formulas. Depending on the application, grinding wheels can feature hybrid, resin or vitrified bonds. Hybrid bonds allow for reduced cycle times, with material removal rates up to ten times that of any resin bond. Hybrid bonds also allow for wheel edge retention of more than twenty times that of resin bonds. They also feature longer spindle life and excellent thermal stability. Resin bonds are superior at grinding all types of Ferrous tools. The bond offers good elasticity, efficient grinding performance and superior surface finish. Phenolic resins are used during wet and dry grinding, off-hand or centerless grinding. Polyimide resins offer increased performance over phenolic resins, greater stock removal, high temperature tolerance and minimal wear. Lastly, vitrified bonds on grinding wheels are ideal for grinding camshafts and crankshafts. They are extremely aggressive and ideal for free cutting. They require less dressing and offer longer truing intervals than resin bonds. For all your CBN wheels, trust the experts at Eagle Superabrasives. In addition to our extensive knowledge and superior customer support, we can offer same day shipping for nearly 90% of orders. Contact us today to place an order!